I've been home bound these days due to another neck injury. My thick skull seems to be supported by not so strong muscles that keep failing to hold it to place, so I get this excruciating pain conditions that make me loose sleep, take pain killers like candy and generally feel miserable. This time I am going to try and see the bright side of having a few days off work and write some posts here and there. Oh, and by posts I mean happy posts, so scratch the start of this one and focus more on what's next. Today, I am going to show you some favorite decor ideas that include happiness! Yeap, you read correct! Happiness! Bright colors, cool textures that sort of thing! I hope you'll like them as much as I do! I am going to start with this bedroom which inspired the whole post! I saw that on pinterest and begun to drool all over my laptop! I want that room!!! This is what HAPPY is all about! Then I saw these pillows from LoveJoyCreate on etsy and fell in love! I guess if you are not so thrilled about the color splash above you can use a few drops of color here and there to brighen up a room, right? 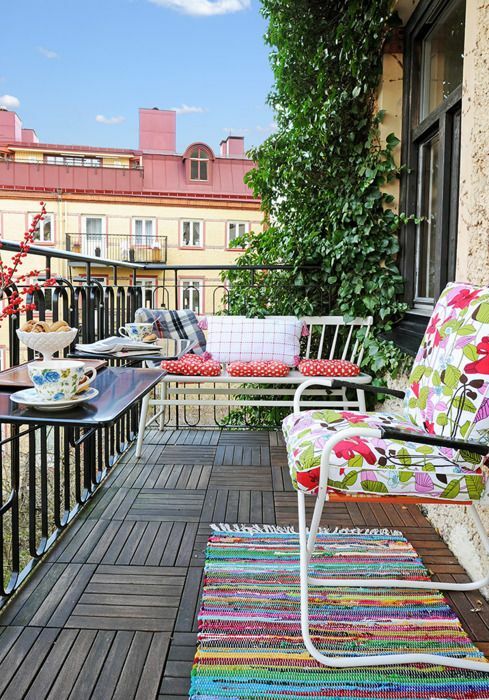 I don't know what says happiness better than having your morning coffee at your colorful balcony! Notice how the color mostly comes from the fabrics used. Who says you have to have a lot of plants to have a happy view? I love my flowers but for those who don't this is a great solution! Here's another think to make you happy while drinking you morning coffee: Happy colorful coasters! How cute are they? And who says your bathroom has to be dull and boring? How about making it bright and ...happy! Since it is summer you may want to invest some of your time and turn you old boring chairs into magnificent colorful chairs that will brighten up any space! It is really not so difficult and look how great a bunch of them look together! Oh, If you are looking for a way to make a boring desk gorgeous, then take a look at Eleanna's tutorial in this very blog! I hope you like my suggestions for a happy decor. Whatever you decide to do to your home, remember what Audrey used to say about happiness. "Happy girls are the pretiest girls!"